Since 2008, EMR adoption rates have risen dramatically, driven primarily by the HITECH Act and the Affordable Care Act of 2010. Some of the main reasons behind the EMR's popularity gains include the technology's ability to improve patient outcomes, increase workflow efficiencies, capture both structured and unstructured data, stabilize cost efficiencies, boost reimbursement rates, and achieve interoperability. Now that the move to ICD-10 will soon become a speck in HIM's rearview mirror (OK, that's a bit of an exaggeration), the next big topic—along with interoperability—to take center stage promises to be data-related issues. Structured data, unstructured data, data analytics, Big Data, health care data … it's all about the data. Wikipedia defines data as "a set of values of qualitative or quantitative variables; restated, pieces of data are individual pieces of information. Data is measured, collected, reported, and analyzed, whereupon it can be visualized using graphs or images. Data as a general concept refers to the fact that some existing information or knowledge is represented or coded in some form suitable for better usage or processing." Now, how best to capture those data. Meaningful use stages 1 and 2 have specific core and menu objectives that must be met in order for health care providers and institutions to receive incentive payments and subsequently not be penalized. Stage 2 has the added proviso "to increase health information exchanges between providers and promote patient engagement." Health care systems continue to be in a state of flux and development. Amidst what has become a highway of health care initiatives bent on escalating the use of technology are an ever-evolving set of criteria and parameters. Beyond meaningful use, there is a general lack of clarity around what data will be needed to achieve the goals of lower readmissions, more cost-effective care delivery, and overall better patient outcomes. Are health care organizations collecting the right data? What are the right data? Is there a universal definition? Are EMRs nimble enough to adapt their systems to extract different data? Can they extract previously collected data and make them relevant with recently gathered information? In its report "Acute Care EMR 2014: The Next Buying Wave," the research firm KLAS found that nearly one-half of the large hospitals interviewed indicated they'll be making a new EMR purchase by 2016. This seems to indicate that some percentage of these institutions made the wrong decision the first time around, and that their original decision-making process lacked clarity. Is there is more clarity now? Will there be in the future? EMRs are essentially data repositories or, more simply put, databases. Massive amounts of highly defined data bits can be queried to show historical medical trends and lend credence to predictive models for improved patient outcomes in the future. From one perspective, this is the easy part—the structured data. But what about unstructured data, particularly the narrative? The dictated narrative portion of patient encounters resides largely in non-XML files, usually an RTF (Rich Text Format) file. While these files do not have "fields" per se, they are searchable and can be parsed using natural language processing engines. During the last five years, there has been contention between EMR vendors attempting to eliminate the dictated narrative and medical transcription companies making the case that the narrative continues to be essential to an optimized, accurate description of patient encounters. While dictation has been much maligned recently by several large EMR vendors, it's starting to become clear and generally accepted that point-and-click documentation can't capture all of the necessary data. Several problems have become associated with point-and-click data capture. One issue is that it's impossible to address every possible parameter in drop-down menus. A typical patient visit to a physician practice begins with a nurse capturing vital signs and asking questions about allergies, medication changes, and other "checklist" items. Then, the physician takes over, completing—in the parlance of medical transcription—the subjective (the patient's story), the objective (physical examination), assessment (diagnoses), and plan. Simon Beaulah, director of health care strategy at Linguamatics, which deploys natural language processing-based text mining platforms, believes digging deeper into the subjective has long-term effects on patient care. "Significant insight into a patient's potential clinical risk can be gained from analyzing references to their home life. For example, consider these different comments from discharge planners: 'lives alone' and 'going home with husband.' Analysis of this unstructured text indicates that the social support structure is very different between the two cases and that the former is higher risk and requiring more care coordination. This type of insight, which is so vital to personalizing the patient experience, cannot be captured effectively with point-and-click interfaces or drop-down menus," he says. Beaulah's example raises several questions. What other data are not being captured? Is it required that all data fields in the EMR be completed? Probably not, considering the many variables inherent in each patient encounter. Who decides whether a data field is filled in? Recently, AMIA's EHR task force released a report on the technology's current status as well as what its future may hold. In general, the report lauded the benefits of EHRs but admitted there still are several significant hurdles to clear. "Over the last five years, stimulated by the changing health care environment and the HITECH meaningful use EHR incentive program, EHR adoption has grown remarkably, and there's early evidence of benefits in safety and quality as a result," the report reads. "However, with this broad adoption, many clinicians are voicing concerns that EHR use has had unintended clinical consequences, including reduced time for patient-clinician interaction, transfer of new and burdensome data entry tasks to front-line clinicians, and lengthened workdays." 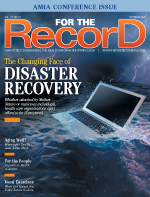 The inability of EHRs to connect to various systems has been a main source of physician dissatisfaction, the report notes. "Interoperability between different EHR systems has languished despite large efforts. These frustrations are contributing to a decreased satisfaction with professional work life. In professional journals, press reports, on wards and in clinics, we have heard of the difficulties that the transition to EHRs has created. Clinicians ask for help getting through their days, which often extend into evenings devoted to writing notes. Examples of comments include 'Computers always make things faster and cheaper. Not this time,' and 'My doctor pays more attention to the computer than to me.'" • support person-centered care delivery. As the industry steps into the next phase of improved health care analysis and delivery, it's important to recognize that the need for better data analytics is just getting started. Fueled by the move to affordable care requiring better population health, clinical risk modeling, and care coordination, it's a landscape ripe with challenges and opportunities. — Linda Sullivan is CEO and owner of New England Medical Transcription.